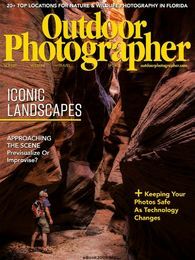 Conservation: Cover Of Outdoor Photographer! In addition to my feature article "Find Your Icon", Outdoor Photographer featured my self-portrait on the cover of the March, 2018 Landscape Issue. I made this image in Buckskin Gulch, Glen Canyon Nat'l. Rec. Area, where I was constantly looking up at giant logs and tree trunks lodged in the top of the deep slot canyon. The power of water, with everything shaped by it, yet there is none in sight. This work is part of my multi-year Grand Canyon watershed project with Braided River.